There can be any reason why you need to reset (Your Macbook Pro Finance product) to factory settings. Maybe, some virus has infected your MacBook and has left you asking yourself why is my mac so slow or perhaps, you’re selling it out and want to ensure your privacy by removing all your data from it. Whatever be the reason, we’re there to help you reset your Mac. And did you know that even after you’ve deleted your data from your computer, it can still be recovered. To make sure that doesn’t happen, take help of the best mac cleaner that shreds all private files to prevent recovery. Let’s take a look at how to hard reset macbook pro with these simple steps. It’s very easy to hard reset macbook pro and resolve all your computer’s performance-sapping issues like why is my mac so slow. To help you reset macbook pro to factory settings, we’ve brought this helpful step-by-step guide that even a novice will find easy to understand. The first thing you need to do to hard reset macbook pro is making a backup of all your important data somewhere externally. This is because hard reset of macbook pro will remove all your data from your Mac’s hard drive. So, it’s better to move your important files and folders to some external drive or the cloud. You can use the best mac cleaner to make backups of your data. Once you’ve backed up your files, turn your MacBook Pro off for a while. Connect it to its AC adapter and turn it on again. While it’s booting up, press and hold these two keys together: Command + R. Doing so will begin the restore process. Keep holding these keys until you see the Apple logo on the screen. When you release the keys, you’ll be redirected to an alternative start screen where you can use the “Mac OS X Utilities” menu. Before you reset macbook pro completely, you must connect your Mac to the Internet. To do that, choose “Wi-Fi” from the menu and select the router you use. Enter your Wi-Fi credentials if it’s password-protected. The Utilities menu may vary according to your version of OS X. Open the menu. Here, you may find either “OS X Recovery” or “Internet Recovery” option. Choose whichever you see. Now, you’ll get the “Reinstall OS X” option. Select it, and wait while your Mac is connecting to the Internet to accumulate your computer’s information from Apple servers. On the next step, you may be asked to provide your Apple account credentials. When you’ve provided the same, you’ll be taken to where downloading of the latest OS X and apps takes place on your Mac. Now, your hard disk will automatically be formatted, resolving your why is my mac so slow issue. You can also use the best mac cleaner to take care of your Mac’s speed-sapping issues. That’s it! 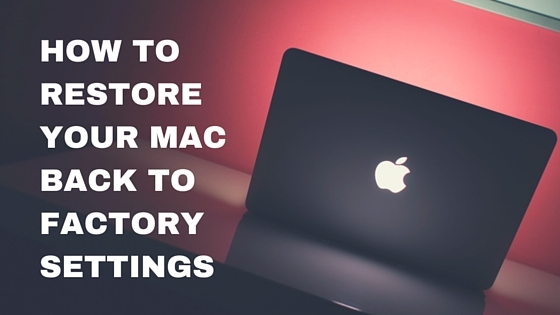 This is how to restore macbook pro to factory settings. Once you have completely reset macbook pro to factory settings, restart your MacBook Pro and notice the changes. You are now free to either use it or sell it without any worries about your data. It’s not a rocket science to hard reset macbook pro. After you get the complete knowledge of how to hard reset macbook pro, you’ll be able to do so effortlessly. Once done, use the best mac cleaner to make sure no existing technology can recover the files you have deleted. By resetting your MacBook Pro, you will be able to lighten your Mac and fix why is my mac so slow. Author Bio:- She has been working as a technical content writer in the field of software development on a variety of products like Best Mac Cleaner and Idencard Digital Business Card App.